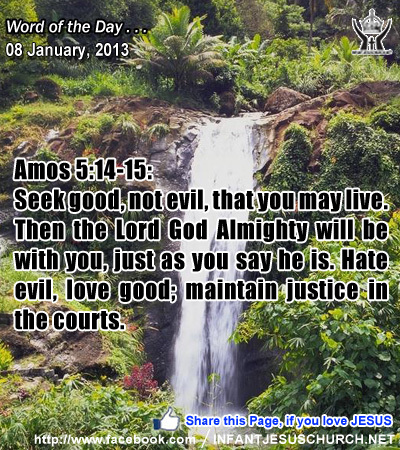 Amos 5:14-15: Seek good, not evil, that you may live. Then the Lord God Almighty will be with you, just as you say he is. Hate evil, love good; maintain justice in the courts. Heavenly Father, your uprightness and holiness are beyond us. We know that our best efforts are only vain attempts to attain them. Yet we long, dear Father, to be more like you in every way that it is humanly possible. Let us know of your company with us as we look for after you and your character in each one of us life. In the name of Infant Jesus name we pray. Amen. 34As he went ashore he saw a great throng, and he had compassion on them, because they were like sheep without a shepherd; and he began to teach them many things. 35And when it grew late, his disciples came to him and said, "This is a lonely place, and the hour is now late; 36send them away, to go into the country and villages round about and buy themselves something to eat." 37But he answered them, "You give them something to eat." And they said to him, "Shall we go and buy two hundred denarii worth of bread, and give it to them to eat?" 38And he said to them, "How many loaves have you? Go and see." And when they had found out, they said, "Five, and two fish." 39 Then he commanded them all to sit down by companies upon the green grass. 40So they sat down in groups, by hundreds and by fifties. 41And taking the five loaves and the two fish he looked up to heaven, and blessed, and broke the loaves, and gave them to the disciples to set before the people; and he divided the two fish among them all. 42And they all ate and were satisfied. 43And they took up twelve baskets full of broken pieces and of the fish. 44And those who ate the loaves were five thousand men. Today’s Gospel we see the miraculous feeding of such a great multitude pointed to God's provision of manna in the wilderness for the people of Israel under Moses' leadership. This food foreshadowed the true heavenly bread which Jesus would present his followers. Jesus declare only God can make: He is the true bread of heaven that can please the deepest hunger we experience. The feeding of the five thousand shows the extraordinary generosity of God and his great kindness towards us. In the increase of the loaves and fishes we see a sign and a symbol of what God always does. When God gives, he gives abundantly. He gives more than we need for ourselves that we may have amazing to share with others, especially those who require what they need. God takes the small we have and multiplies it for the good of others. Do we trust in God's provision for us and do we share freely with others, especially those who are in need or want? Loving Infant Jesus, you satisfy the deepest longings of our hearts and you nourished us with the finest of wheat. Fill us with gratitude for your blessings and give us a generous heart that we may freely share with others what you have given to me.